I hope everyone can observe the fact that most complementary work luncheons are usually unhealthy. Even for dietitians (although one might THINK you would provide dietitians a well balanced meal; whole grains, fruits, and vegetables), the spread is not of the health nut variety. At one particular luncheon, we were presented with two HUGE pans of lasagna (cheesy, ooey, gooey, meaty), salad (with all the fixings…bacon, avocado, cheese, full-fat dressings), CHEESY bread (yes, amazing but honestly? ), AND carrot cake cupcakes (to round out the meal right?). Not even a dietitian stands a chance. So how did I handle the situation? Well, let’s talk about how I didn’t handle the situation and the mistakes I made. Hopefully we can ALL learn from my experience. 1) I came to luncheon STARVING. I had no opportunity to eat my mid-morning snack because we were just too busy. I got to the luncheon famished and we were still forced to sit an extra 10 minutes, listening to an opening speech. Meanwhile, the food just sat there…smelling GOOD. My inhibitions were lowered and I could NOT wait to dig in! What would have been smarter? I SHOULD have eaten the small nectarine and yogurt I packed for my morning snack and then my blood sugar wouldn’t have been so low. I could have then processed my thoughts more logically… aka not sampled everything on the lunch display. 2) My eyes were bigger than my stomach. I put way too much food on my plate from the start. I took a small slice of both the veggie and meaty lasagna, about a cup of salad with all the fixings, 1 large slice of cheesy bread, and a carrot cake cupcake. Since my inhibitions were lowered from being SO hungry, my eyes wanted everything! 3) I did NOT pick ONE favorite food. After sampling everything on my plate, I still found myself eating the foods that I did not absolutely love. I did not care for the vegetarian lasagna but still ate it. Why!!!!???? When in a situation where all the food choices are going to be high in calories and fat, it’s essential to pick and choose what you want to indulge in. In my case, I ate and sampled ALL the foods available, when I should have stuck with a large portion of salad and chose either lasagna OR cheesy bread. Then MAYBE I could split a dessert with a coworker. But again, since my blood sugar was low from not eating in over 4 hours, I was not thinking rationally. I just knew I needed to eat and everything looked amazing! 4) Underestimating just how much you ate. As a dietitian, this is NOT a mistake I made yesterday. I knew roughly how many calories I was consuming, and sometimes I tend to OVER-estimate. But some of you may be thinking…”she really didn’t eat that much.” So I feel like I need to explain because underestimating calories is a common diet mistake. Salad. Avocado, bacon, cheese, and dressing: high in fat, high in calories = hearty meal by itself. Cheesy bread: Not sure if I really have to explain, but HIGH in fat and calories! The lasagna: Just because the pieces I ate only equaled 1 small piece, when you consider all the layers of cheese and meat, the calories add up quickly! Carrot cake cupcake. Listen, just because a dessert has carrot in the name, does not mean it’s not still high in calories and fat. This baby was at least 350 calories and I ate almost half. If you are looking for a low-fat carrot cake recipe, check out my low-fat carrot cake cookies with cream cheese frosting! When you think of each of these foods individually, it starts to become apparent just how many calories I may have consumed. Possibly over 1000?? Yikes! 5) Everyone else was doing it. I was in a room with ALL dietitians for crying out loud. Why was I the ONLY one who was thinking in terms of calories, fat, and portion control? No one else seemed to care. I mean, I watched a 100lb post-par tum dietitian scarf a piece of lasagna that was bigger than her head! So if she can do it, then why can’t I?? I let myself get sucked into the mantra that if THEY can do it, then I can do it too! I am sure this scenario has probably happened to most everyone in the past. You are full but the people around you are still eating or trying to coax you in to sharing dessert. When this happens, it can be VERY hard to practice your own self-control. What I NORMALLY do is try to be one of the last people at the buffet line and one of the last to finish my plate. This way, while everyone else is heading up for seconds, I am still on the first round of food and giving my body enough time to process thoughts of satiety. Eat slowly and MINDFULLY! 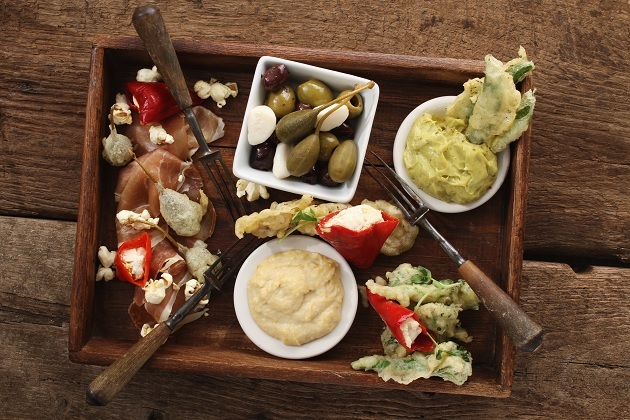 Savor every bite. 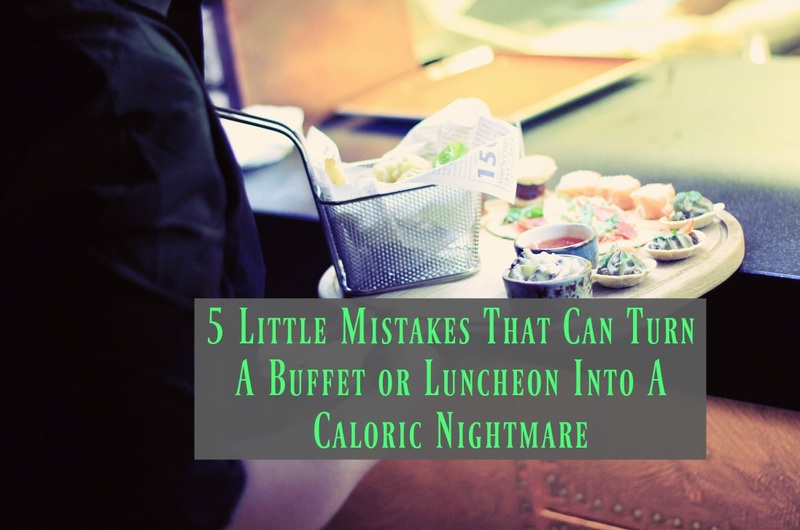 See how easily all these LITTLE mistakes can turn in to a caloric nightmare? It’s a domino effect. So what did I do afterwards? Well at first I felt guilt, but ultimately concluded it was better to just let it go. I knew I wasn’t going to gain 5 lbs from ONE calorically disastrous meal (come on… we ALL have these thoughts!). Instead, I made sure to have a healthy dinner, squeezed in an extra walk in the afternoon, and had a great workout that evening. Well, I would have already forgotten the scenario if I did not choose to write this post!! Live, Learn, and Get Over It!! Just don’t make it an every day occurence!